OK, so this post was supposed to come out before Easter. I was going to bill it as a fun appetizer for your Easter brunch or lunch. Things happen and this post just didn't quite get done on time. 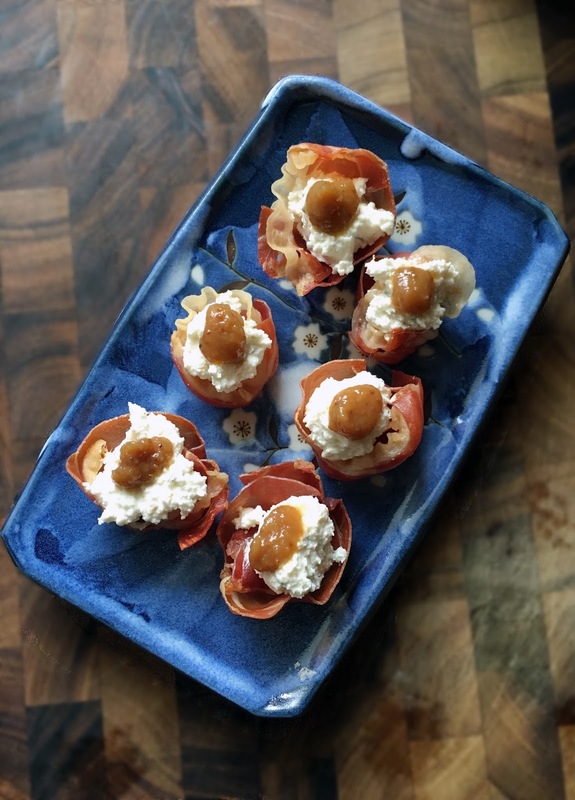 Nonetheless, these little prosciutto cups filled with a tangy goat cheese mixture and topped with fig jam are still party-perfect. This recipe all started with a jar of Skappo Family Spread fig jam. Growing up in an Italian household, it seems like instinct to immediately want to pair fig with prosciutto. It's just a classic combination. Then, it must have been on Facebook, I saw one of those food videos by Buzzfeed or one of those sites about making something in a bacon cup. That was the ah-ha moment. 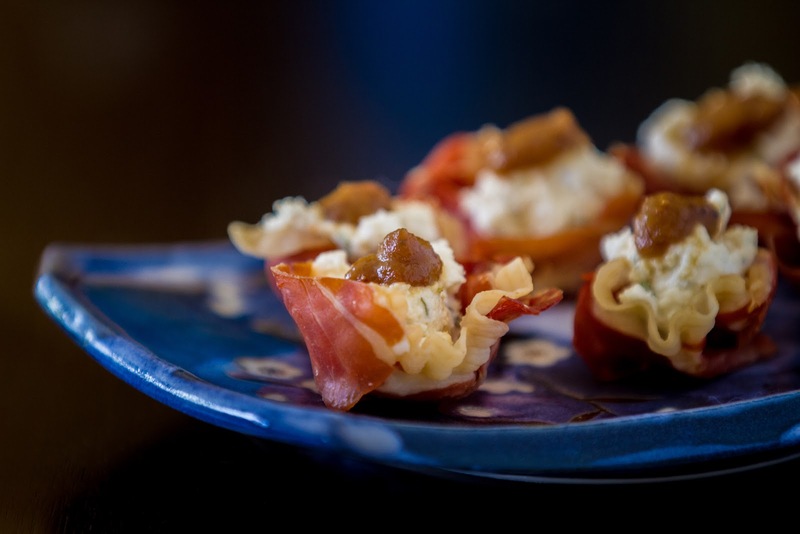 Prosciutto cups. They would be the perfect vehicle for a creamy filling. Then I thought that the salty could nicely highlight something earthy and tangy, so that led my taste buds to goat cheese. And all those savory elements needed balance from a little sweet, and that's where the fig jam came in. The resulting appetizer is not only delicious, but I think, looks fancy enough for a party. Cut each slice of prosciutto in half lengthwise. Then, cut each strip in half crosswise. 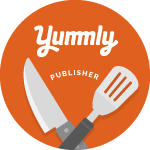 Wrap each space in a mini muffin tin with two short strips of prosciutto. Make sure to overlap the pieces to form a cup. Place in oven and bake for 10 to 12 minutes. Remove from oven. Careful transfer each prosciutto cup from the muffin tin onto a paper towel to drain excess fat. Let cool completely. As the cups cool, make the filling. In a small bowl stir together the goat cheese, ricotta, dried thyme and crushed hot pepper. Using a small spoon or piping bag, fill each prosciutto cup with about ½ teaspoon of the cheese filling. Top each cup with scant ¼ teaspoon of fig jam. I think if I made them I would need to have more....and more...and MORE!